← Are Jehovah's Witnesses Christians? John stated of the angel: his face was as the sun. This is clearly reminiscent of the awe-inspiring transfiguration vision that John had witnessed some 60 years earlier, when Jesus’ face also shone like the sun. And the fact that the angel cried out with a loud voice just as when a lion roars ought to call to mind that Jesus is called the lion of the tribe of Judah. 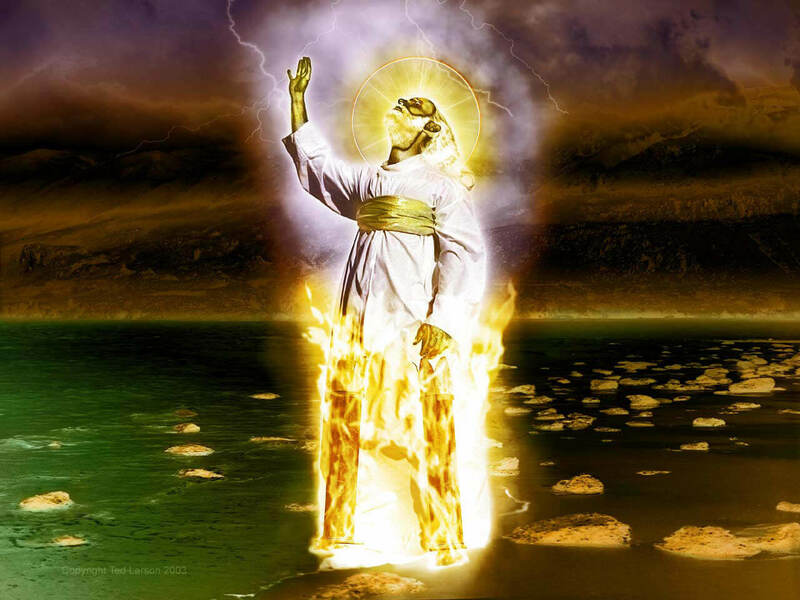 Also, in the first chapter of Revelation Jesus is depicted as having feet that glowed like copper in a furnace and a voice like the rush of many waters. In the 10th chapter the strong angel speaks like thunder. This is in keeping With the fact that Jesus is called the Word of God. Whereas the comparisons may be different, they portray a similar vision. The sacred secret of God pertains to the so-called seed of the woman, which is Christ in company with Jehovah’s hand-picked 144,000. Naturally the mystery of God, as some translations have worded it, will not be finished until all the chosen ones have been approved and sealed and Christ manifests himself to them u2013 as is portrayed by the interaction of John with the descending angel in the Revelation vision. That John participated in the vision as an awestruck observer of Christ’s descent to earth and that Jesus spoke to him and handed him the little scroll, thereby re-commissioning him to “prophesy again with regard to peoples and nations and tongues and many kings,” portends the manifestation of Christ to the remaining anointed ones on earth and their final assignment to give witness to Jesus’ presence in glory. Of course, the aged apostle was not personally re-commissioned by Christ to go on some sort of missionary tour of the Mediterranean region. John was a very old man and a prisoner on the remote island of Patmos at the time. His earthly ministry was nearly over. The apostle merely represented in the vision those anointed servants of God who will be on earth when Christ actually comes down to finish the mystery of God. The fact that John was commissioned to “prophesy again” immediately after the strong angel had declared the sacred secret of God to be accomplished is significant. It indicates that there will be a final witness given to the world after the calling and choosing of the sons of the kingdom has come to a finish. The Watchtower has convinced Jehovah’s Witnesses that strong angel came down from heaven in 1914 and the mystery of God was then finished. But how reasonable is that? Consider the fact that in 1914 the International Bible Students were laboring under the impression that the presence of Christ had begun in 1874. It would be ten more years before the Watchtower Society would adjust their numbers. But if Christ really returned in 1914 and the sacred secret of God was then complete would it not be reasonable to expect that God’s servants would have been enlightened as to his presence when it first began and not a decade later? Also in 1914 the great crowd had not even begun to form as an identifiable group. It would be 21 years after 1914 before the Watchtower Society correctly explained what the great crowd is that is destined to come out of the great tribulation. But again, how could the mystery of God have been complete in 1914 if Christians were still ignorant of vital aspects of the divine purpose? What is the purpose of a revelation and unveiling if those on the earth who claim to be God’s servants remain in an unenlightened state after the supposed apocalypse of Christ? In the Revelation the apostle John was transported by inspiration to the Lord’s Day, not only to witness, but also to directly participate in a dramatic prophetic vision with Christ, similar to his transfiguration experience. John stated of the angel: “his face was as the sun.” This is clearly reminiscent of the awe-inspiring transfiguration vision that John had witnessed some 60 years earlier, when Jesus’ face also shone like the sun. And the fact that the angel “cried out with a loud voice just as when a lion roars”ought to call to mind that Jesus is called “the lion of the tribe of Judah.” Also, in the first chapter of Revelation Jesus is depicted as having feet that glowed like copper in a furnace and a voice like the rush of many waters. In the 10th chapter the strong angel speaks like thunder. This is in keeping with the fact that Jesus is called the Word of God. “The sacred secret of God,” pertains to the so-called seed of the woman, which is Christ in company with Jehovah’s hand-picked 144,000. Naturally, “the mystery of God,” as some translations have worded it, will not be finished until all the chosen ones have been approved and sealed and Christ manifests himself to them – as is portrayed by the interaction of John with the descending angel in the Revelation vision. The Watchtower has convinced Jehovah’s Witnesses that the strong angel came down from heaven in 1914 and the mystery of God was then finished. But how reasonable is that? Consider, for starters, the fact that in 1914 the International Bible Students were laboring under the impression that the presence of Christ had begun in 1874. It was not until 1941 that the Watchtower Society adjusted the date. But if Christ really returned in 1914 and the sacred secret of God was then complete would it not be reasonable to expect that God’s servants would have been enlightened as to his presence when it first began and not a few decades later? Also in 1914 the great crowd had not even begun to form as an identifiable group. Back then it was thought to be a secondary heavenly group. It would be 21 years after 1914 before the Watchtower Society correctly explained what the great crowd is that is destined to come out of the great tribulation. But again, how could the mystery of God have been complete in 1914 if Christians were still ignorant of vital aspects of the divine purpose? What is the purpose of a revelation and unveiling if those on the earth who claim to be God’s servants remain in an unenlightened state after the supposed apocalypse of Christ? There is another intriguing aspect in connection with the strong angel. In the opening chapters of Ezekiel the exiled prophet was overwhelmed by a vision of an immense fiery chariot with wheels within wheels and shrouded in flaming fire. The celestial chariot approached the wide-eyed prophet and spoke with him. And just as in the vision of Revelation Ezekiel was also handed a scroll, which he was then commanded to ingest. The roll of the book also tasted like honey for sweetness, just like the scroll that John consumed. There is another intriguing aspect in connection with the strong angel. 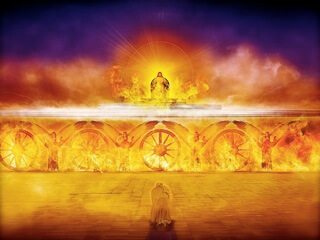 In the opening chapters of Ezekiel the exiled prophet was overwhelmed by a vision of an immense fiery chariot with wheels within wheels and shrouded in flaming fire. The celestial chariot approached the wide-eyed prophet and spoke with him. And just as in the vision of Revelation Ezekiel was also handed a scroll, which he was then commanded to ingest. The roll of the book also tasted like honey for sweetness, just like the scroll that John consumed.And just as the strong angel had a rainbow over his head the rider of the heavenly chariot also had a rainbow above him too. Ezekiel described the rider as someone like a son of man. Although Jehovah describes himself in anthropomorphic terms he is never called the son of man or someone like a son of man. For example, in the seventh chapter of Daniel Jehovah is portrayed as the Ancient of days to whom someone like a son of man gains access. The designation of son of man is appropriately reserved for Jesus Christ since he did indeed become a son of mankind. Ezekiel went on to describe the person seated upon the chariot-like throne as bearing the very glory of Jehovah. But that description could well be applied to Jesus Christ when he comes in the glory of his Father and sits down upon Jehovah’s throne. There is no question that Ezekiel would have understood the vision as pertaining exclusively to Jehovah God. Ezekiel knew nothing about the Messiah. The nature and origin and work of the Messiah were still a sacred secret back then. And no doubt too, Ezekiel would have been most concerned about the imminent judgment that was to be revealed against Jerusalem. Yet the prophecy that he penned has relevance far beyond his time. The fact that Revelation draws upon the symbolism found in the ancient Hebrew prophecies, of which Ezekiel was an integral part, indicates such. But given the fact that Jehovah God has committed virtually every aspect of his kingship to his son there is nothing in the prophecy of Ezekiel that precludes Jesus Christ from being one seated upon the throne of the celestial chariot in its modern fulfillment. That the chariot of heaven came to the vicinity of the earth and communicated to a servant of God and gave him an assignment to preach God’s adverse judgments indicates that the vision of Ezekiel will ultimately be realized when Christ arrives in his kingdom. That is certainly what is symbolized in the 10th chapter of Revelation. And just as the strong angel had a rainbow over his head the rider of the heavenly chariot also had a rainbow above him too. Ezekiel described the rider as someone like a son of man. Although Jehovah describes himself in anthropomorphic terms he is never called the son of man or someone like a son of man. For example, in the seventh chapter of Daniel Jehovah is portrayed as the Ancient of days to whom someone like a son of man gains access. The designation of “son of man” is appropriately reserved for Jesus Christ since he did indeed become a son of mankind. All things considered, there is no question that the sacred secret of God is yet to be revealed. Is not the prospect, indeed the certainty of a future unveiling of Christ, positively awesome to contemplate?